What makes our machines so special? 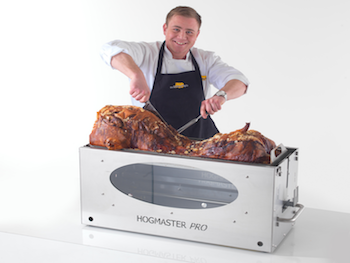 It’s a quality machine that has been designed with the help of experienced hog roast chefs rather than by people who have no experience of using hog roast machines. What a lot of people forget about hog roast machines is that the cooking process, whilst crucial, is just one factor that makes a machine special. The other is that the machine has to be able to stand up to the rigours of day in day out catering, and that can mean being moved about a fair bit, often over rough territory and through tight spots. For a lesser machine this can easily be damaging but ours is a tough nut to crack. You also get superb British engineering with our hog roast machines coupled with some truly versatile touches such as the dual cooking areas which allow you to cook two things at once. All this quality and attention to detail may mean the machine is more expensive than some others but this is a unit that will stand the test of time and will be around a long time after the lesser alternatives have gone to hog roast retirement home. And of course, if you really want to see the quality for yourself, you could always hire one of our machines or even come to the factory. What if I am asked to cook something other than pig? That is a common question that we get and it really is not an issue at all. You see, although the machines are called hog roast machines, you are not restricted to cooking just pig. It’s simply that this is what they were mainly designed for. Our machine is perfect for cooking a wide range of meats, so you might want to consider cooking a lamb or joint of beef and see what the results are like! We think they will taste delicious but see what you think. And don’t forget to check out the chicken spit kit as this allows you to go completely chicken crazy and cook over thirty large birds! 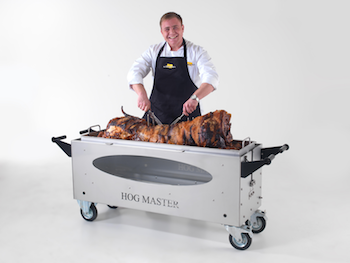 With our hog roast machine, you also have the option of cooking a regular hog roast in the upper level and a separate meat option in the lower level, which could be ideal if you have just a few guests who would like something different. Can I used these machines without electricity? This depends on how you want to cook. If you wanted to do a spit roast then you need to be able to access mains power for the spit motor, though a car battery option is available. This would mean that you can still spit roast outdoors at a school fair or at a music festival for example. If you just wanted to use the regular roast facility without needing the spit then you are certainly okay as this just needs the gas on its own, so you are not having to rely on any fixed or portable electrical power at all with this scenario. If you really wanted to spit roast the meat yet don’t have mains power or a car battery option, why not spit roast indoors and then take outside in the carving position? Whatever option you choose we are certain that the guests are going to love the taste of the meat regardless! If I start a hog roast business, will I do okay? We think you will, but just like any other business, you will really need to work hard to get the results you want out of the business. 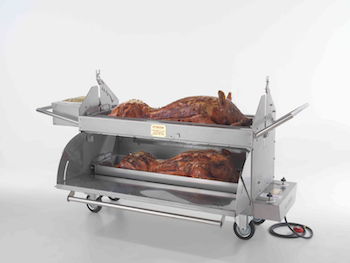 Buying one of our hog roast machines is a fantastic start and you are certainly making a fantastic investment by choosing such a great and versatile piece of equipment but you are also going to need to ready for long hours and lots of graft. The best hog roast caterers are not just the ones who cook fantastic food day after day but are the ones who really offer fantastic service with a smile and go out of their way to ensure every client is not just satisfied but delighted. Doing that increases the chances of future bookings and also encourages to spread the word about how great you and your hog roast machine are. This sort of word of mouth recommendation is invaluable, but you have to earn it! And don’t forget, we offer all our new hog roaster buyers free training videos and business support, just in case you do need a bit of help. Think positive, work hard, put the hours in and you should be just fine. Copyright © 2019 Hog Roast Machines Direct . All Rights Reserved.